A postseason share on World Series champion Boston was worth $416,838, down from a record $438,902 for Houston in 2017. The commissioner's office said Monday the Red Sox voted 66 full shares, 10.025 partial shares and eight cash awards. The Astros had 60 full shares, 9.23 partial shares and four cash awards. The players' pool was a record $88.19 million, breaking the mark of $84.5 million set last year. A share on the NL champion Dodgers was worth $262,027, up from $259,722 for Los Angeles in 2017. Full shares were worth $154,656 for Houston, $122,957 for Milwaukee, $43,082 for the New York Yankees, $40,376 for Atlanta, $40,336 for Colorado, $37,040 for Cleveland, $19,760 for Oakland and $16,155 for the Chicago Cubs. 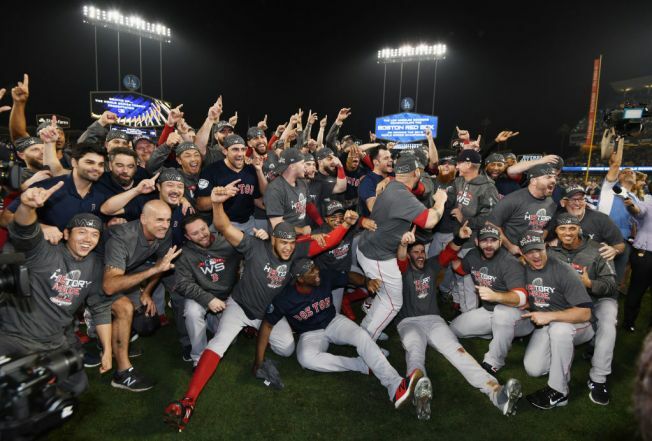 The players' pool included 50 percent of the gate receipts from wild-card games and 60 percent each from the first three games of the Division Series and the first four games of the League Championship Series and World Series.